Kitties Litter Playgrounds, Spreading Harmful Parasites : Shots - Health News A parasite that plays a role in a range of human illnesses may be more common than you thought. More than a million cats in the U.S. are thought to be spreading the parasite. 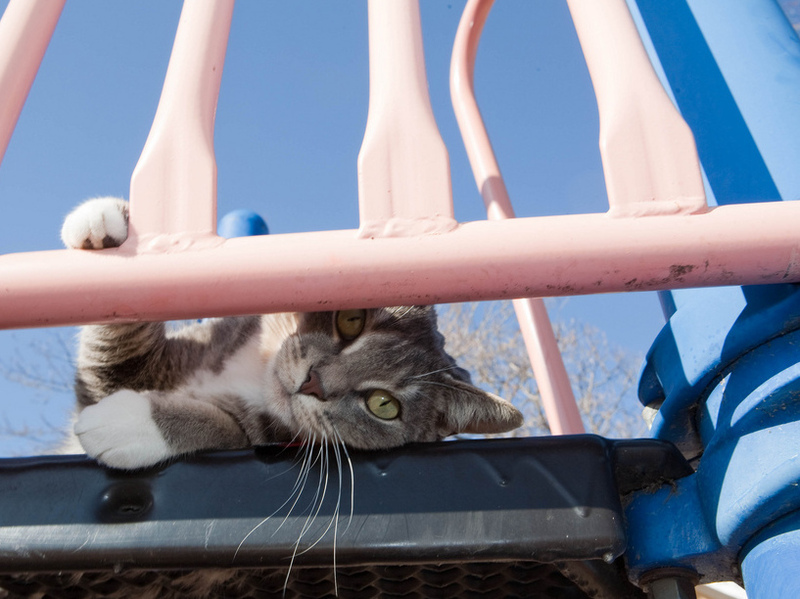 Playgrounds and sandboxes are popular hangouts for free-roaming cats. What they leave behind may not be so popular with humans. That cat poop can pose a health risk to humans no longer surprises us. Some cats carry a parasite called Toxoplasma gondii. Infected cats shed embryonic T. gondii, called oocysts, in their feces. These oocysts are easily transmitted to humans, and researchers have explored their possible link to various mental health problems, including schizophrenia. More recently, studies of school-age children show a correlation between testing positive for T. gondii and having difficulty in school. The parasites can cause more acute health problems in newborns and people with weak immune systems, as the Centers for Disease Control and Prevention points out. Now a review published in Trends in Parasitology explores how substantial a public health threat the parasite poses in the United States. One thing's pretty clear: There are a lot of oocysts out there. Research psychiatrist Dr. E. Fuller Torrey and pediatric infectious disease specialist Dr. Robert Yolken, who have spent years investigating the role that animals play in the spread of infectious diseases, co-authored the roundup. The cat population is growing. Every day about 1 million cats in the U.S. are actively pooping out as many as 50 million oocysts apiece. The oocycts are hard to kill. There is a well-documented correlation between mental illness and testing positive for T. gondii antibodies. "This is a public health problem that bears more scrutiny," Torrey says. "We're walking a tight line between alarming people and failing to point out obvious health problems that need to be paid attention to." Correlation isn't the same as causation, however, particularly when it comes to the area of mental health. "The association has been discussed, but it has not been completely accepted by everyone," Dr. William Schaffner, chairman of the department of preventive medicine at Vanderbilt University, told NBC News. "If people were convinced of that, we would have acted on it." Katie Lisnik, who is the director of Cat Protection and Policy at the Humane Society, says there are 86 million cats that are household pets in the United States, and another 20 million to 80 million free-roaming cats. The bulk of oocysts are getting dropped in the very places where humans are most active. "Feral cats tend to be where the people are, and it makes sense," Lisnik says. "They want to be around us, and we're their source of food." The presence of large numbers of oocysts on playgrounds and in sandboxes, where kids stick their hands in their mouths every couple of minutes, bears particular attention, Torrey says. "If you have a sandbox that isn't covered, get rid of the sand and cover it when kids aren't playing," he says. He also has advice for green thumbs. "Studies have shown that you can have almost 100 oocysts under your fingernails after gardening. So always wash your hands after gardening, and wash vegetables before eating them," he says. In case you're afraid of what this means for your own pet, Torrey says, "strictly indoor cats really shouldn't be a problem. The chance of them becoming infected is very low." Torrey also says that while there has been a drastic increase in the number of feral cats, there has been a decrease in the number of recorded cases of T. gondii infection. The public, he says, is more aware of the dangers of eating improperly stored meat, a source of infections. But Torrey also points out that T. gondii can sit dormant in the body for 20 years, so it may actually take a few decades to see the epidemiological effects on humans.